I haven’t laughed out loud this much in a movie in a long time. The re-make of “21 Jump Street” does so many things right: spot-on casting, crude humor (my fave) and tons of action. Channing Tatum and Jonah Hill portray two cops who go undercover to infiltrate a drug ring in a local high school, because neither of them can “make it” on the streets like real cops. Their chemistry is undeniable. They should go down as action movie royalty like Samuel L. Jackson and John Travolta in “Pulp Fiction.” Ok, maybe not that classic. More like Jackie Chan and Chris Tucker in “Rush Hour.” The loads of action (and the shots of Channing) are enough to satisfy both guys and girls. Going up against Jonah Hill comically, Channing had very big shoes to fill. And fill those shoes he did. He stood his ground, and wasn’t entirely slapstick like I was expecting. Hill has even advanced from his “Superbad” days, with a more mature humor, yet still a bit bawdy. On opposite ends of the popularity spectrum in high school, the two play against stereotypes when they hit high school again, where Jenko (Tatum) finds himself with the science nerds, while Schmidt (Hill) becomes the big man on campus. They’re surprised at today’s trends – kids are tolerant, environmental advocates and vegetarians – a pretty clever way of sending out a message. Very Glee. Before I referenced IMDB, I knew the lead student reminded me of James Franco. The voice, mysterious swag, and slight cocky tilt of the head backwards were all too familiar. And what would you know, it’s his younger brother! 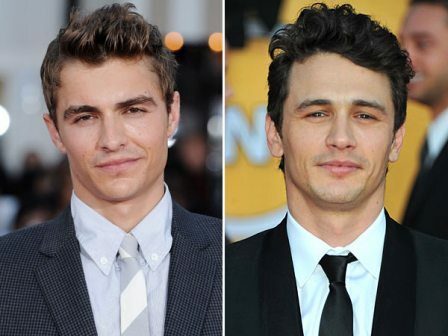 Dave Franco plays Eric, the school’s head drug dealer. He’s likable - crooning on his guitar, preaching about all sorts of advocacy - but he’s involved with some pretty serious stuff. On their first day at school, Jenko and Schmidt are forced to take the drug themselves, to prove they aren’t narcs. Hilarity ensues. Ellie Kemper is amusing as a chemistry teacher, mad-crushing on Jenko. I love this chick, but she’s getting to be a little like her “Office” co-star Ed Helms, and typecast as the space cadet. Rob Riggle is BRILLIANT. This underrated comedic character actor stole every scene he was in with his minute facial expressions. He has perfect comedic timing. After weeks of unsuccessful take-downs of the bad guys (but lots of fun high school parties), Jenko and Schmidt feel pressure from the Police Captain (Ice Cube) and know that their last chance to crack the drug ring is on prom night. The hysterical ending hints at a sequel, and I can only hope one is in the works.